The oriental classical dances are mainly influenced by numerous factors such as language, literature, culture, sculpture, religion, paintings, vocal music and instrumental music. All these have influenced the classical Bharatha Natyam to a great extent. The sculptures could be divided into different varieties. The sculptures are made out of different metals such as copper, iron, brass, Iyempon- combination of five different metals, some are ivory sculptures, some are wooden made sculptures, some are stone made sculptures and some are clay sculptures. Sculptures are the main source, for the research study in oriental dance forms. Bharatha Natyam is a Tamil classical dance form which is widely practised and preserved in Sri Lanka as well. So it is quite appropriate, and important to find out the close relationship between the sculptural influences of Sri Lankan sculptures in Bharatha Natyam. Generally for the research analysis it is a must to trace the coordination between these two different fine arts together. Island wide there are a variety of sculptures available. Most of the sculptures are decorative sculptures which decorate the pillars, the roof tops of the pillars, carved in the pillars, and walls of the archeological sites, Hindu temple towers, Hindu temple walls, Hindu tunnel temples, art galleries, and ancient royal courts. For Bharatha Natyam, the Chithamparam and Thanjavur temple sculptures are the main productive source for dance research work. Similarly in Odissi dance, the Kalinga sculptures are the main source for the Odissi dance and Odissi dance research. The Hindu sculptures provide ample opportunity for the researchers to compare with the practical side of the Bharatha Natyam. In Bharatha Natyam the dancers try their best to imitate and adopt the sculptural poses, sculptural body postures, sculptural body positions, sculptural foot stances and positions, sculptural hand gestures, and sculptural eye glances. This helps the researchers to conduct a comparative research study about sculptures with practical Bharatha Natyam. 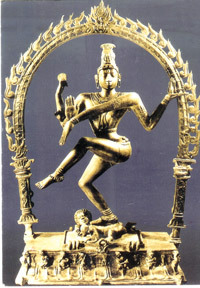 Most of the Bharatha Natyam dance poses resemble the sculptural dance poses, and the 108 Thandava Karanas of Lord Siva. All the sources have been derived from the ancient sculptural poses especially from archeological, and ancient Hindu sculptural poses. The Hindu sculptural poses are strongly derived guidelines from the ancient Hindu Agama sashtra and sutras. That’s why the Hindu deity sculptural poses all over the world must be the same. The basic structures of the Hindu deities are the same, but the basic style of the statues differs from place to place. If we analyze the cause of the differences we will come to the conclusion that these slight variations arise due to the local influences of the area, where that particular sculpture was made. Sri Lankan Hindu temple sculptures are almost the same as the Indian temple sculptures, yet to some extent these sculptures are being influenced by the local traditions and local regional influences. It could be observed by the style of the structures of the sculptures. It is a must that each temple deity, the sculpture should be based on a certain define philosophy. For instance Lord Nataraja’s statue all over the Hindu areas and Hindu temples in Tamil Nadu are almost the same, for instance the Lord Nataraja’s statue which was found in Polannaruwa is quite different from the normal Hindu Nataraja statues. This is due to the regional and cultural influence of the area. This particular Lord Nataraja’s statue implies the Buddhist sculptural influence. The ancient Sivalingam structure found in Polannaruwa is also entirely different from the normal Sivalingam statues in Hindu temples. One could assume that this is due to the cultural, regional, and ideological influence sculptor. In Hinduism some deities are in the standing position, and some deities are in the sitting position. Each hand of the deity depicts certain meaningful hand gesture, if the dancer tries to depict the same sculptural pose in dance, the dancer must adopt the same hand gestures of the selective idol. So the sculptures provide main source for Bharatha Natyam. Bharatha Natyam is a Hindu religious dance form, and it is a must that we must have to follow the Hindu agama and Hindu Shasta traditions.